Every four years, the world celebrates one of the most monumental sporting events in history – the FIFA World Cup. In so many ways, it is a sporting event like no other given its mobilization and marketing power and its ability to tap into core emotions of all people – irrespective of ethnicity, disability, economy or history. As has been seen over the last few weeks, the World Cup also draws up within us the firm recognition of the power of sport, our global common denominator. For millions of people across the world, sport is the ultimate form of expression, a classroom of teaching and learning, and the most potent dissemination tool for key messages on behalf of communities and governments alike every day of the year. From the football pitch in rural Malawi to the recreational cricket game in the parks of India, sport brings people together in a way that few other social mechanisms can. It unites a sense of connectivity in all of us, and it speaks a universal language that brings out excitement, togetherness and anticipation. Harnessing this convening power of sport, Special Olympics serves as a global, grassroots movement dedicated to empowering the lives of people with intellectual disabilities. Serving as an important Development-through-Sport movement, Special Olympics works to create global communities of support, holding over 70,000 competitions a year – about 190 each day. Special Olympics also brings critical services to one of the most marginalized populations on the planet through a wide range of trainings, health screenings, youth programs and public awareness campaigns. We create opportunities for families, community members, local leaders, businesses, law enforcement, celebrities, dignitaries and others to band together to change attitudes and support athletes. Our goal is to reach the 200 million people with intellectual disabilities around the world as well as their families. Football (or soccer in the United States) is the world’s most popular sport. 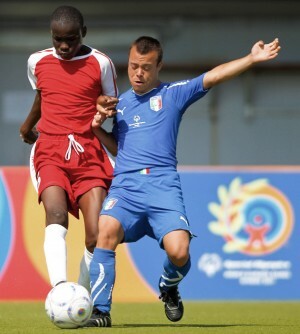 We know football transforms athletes, and we believe it has the popularity and power to help transform attitudes about intellectual disability as well. One of our most important sports programs is the Special Olympics Global Football Initiative, where thousands of Special Olympics athletes are able to train and compete with the support of the professional football clubs Inter-Milan, Italy; Manchester United, Glasgow Celtic and Tottenham Hotspur, United Kingdom; Sports Club Corinthians Paulista, Brazil; Monarcas de Morelia, Mexico; and Sounders FC, USA. Working with FIFA and Soccerex, the leading provider of business events for the global football community, the World Cup has provided an opportunity for Special Olympics to highlight this initiative, giving it greater visibility to a large global football audience and raising awareness of the impact that sports like football can have on the lives of those with intellectual disabilities both on and off the field. So as the World Cup comes to an end, sport for development programs will continue to create a lasting impact around the world. For Special Olympics, the love of the game isn’t a once-every-four-year event but an everyday movement – inching the world ever closer to full inclusion and the realization of human potential, unity and dignity. David Evangelista is Vice President, Global Development and Government Relations for Special Olympics. Follow Special Olympics @SpecialOlympics.